Ninth Annual Family Reading Night was Out of This World! Students from Aurora school districts 129 and 131, and children of IMSA employees, enjoyed a fun filled evening that began with a scientific demonstration put on by the SciTech Hands on Museum, which is located in Aurora. During the evening the children were entertained with crafts, science activities and book readings held during the IMSA staff story time, while their parents were invited on tours of the school led by IMSA student volunteers. A raffle was held and prizes included puzzles of the solar system, craft packages with various crayon selections, movie tickets from Cinemark Tinseltown movie theater in Aurora, and coupons for a local Pizza Hut in Aurora. Nobody went home empty handed, though, because back packs filled with goodies and t-shirts were handed out to every child who attended. Oberweis Dairy provided the ice cream treats that were available during the evening, and the Junior League of Kane and DuPage Counties provided a free book for each child who attended. Dart Container was this year’s event sponsor. Student volunteers from the IRC, Admissions and Allies departments of IMSA helped prepare and oversee crafts for the event, painted faces and assisted in other activities during the night. Thanks to all who helped make this year’s event a success! This entry was posted in Events on November 18, 2014 by nluebke. During these last two months of this year, the 2014 “Faces of IMSA” photo exhibit will on view in the IRC. 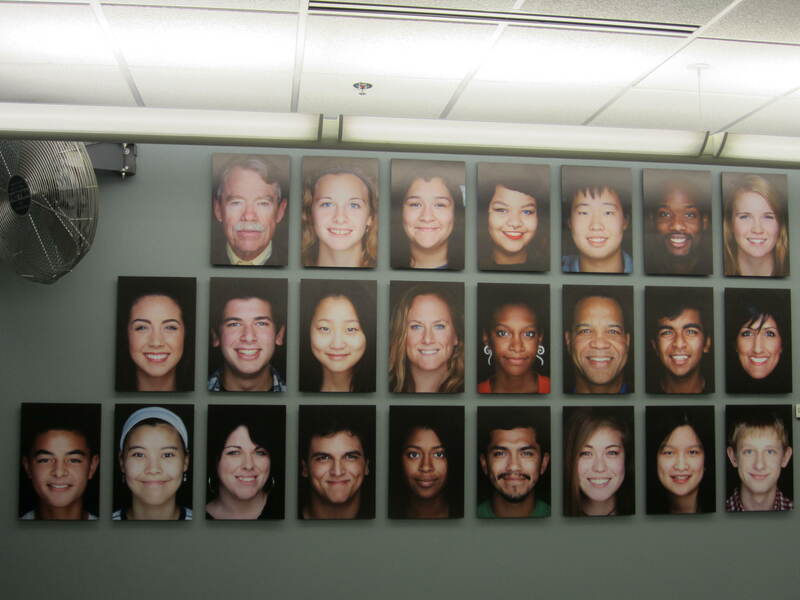 Chris Reader, one of the organizers of this exhibit, took pictures of IMSA students, staff and faculty during a two day studio session in IMSA Media Services. 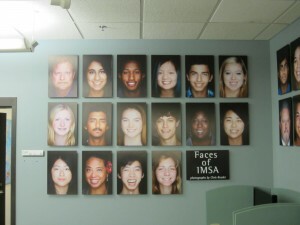 Jean Bigger, IMSA IRC Technical Support Services Supervisor and the other organizer of the exhibit, said that more than 180 members of the IMSA student body, faculty and staff agreed to have their photos taken. All who participated were asked to share their name, age and how they self-identified. A list of words used to self-identify is on the IMSA Facebook page of this album (see the link below). 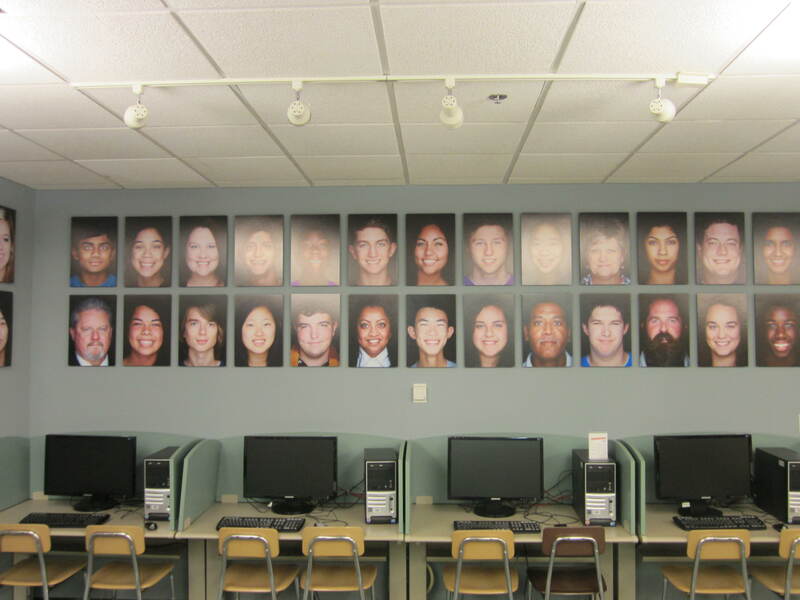 The result of the two day photo session is the 66 photographs exhibited on the walls of the IRC, which were mounted and displayed as they were processed. 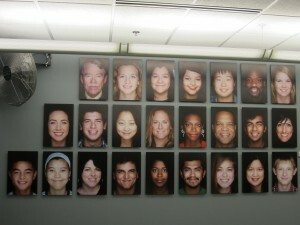 The remaining photos will be displayed as a slide show on the monitor outside the west entrance to the IRC. In addition to Chris Reader, the photographer, and Jean Bigger, the organizer, the following people helped make this exhibit a reality: Clay Sewell and Robert Schiltz handled exhibit design and installation; Amy De La Torre, Emily Rader, Joseph Jagusah, Anna Borromeo, Chinyere Kemet, Puja Mittal, Nicole Aldridge handled production and assembly; Adrienne Coleman promoted the exhibit; and IMSA Media Services and Marketing were also involved. 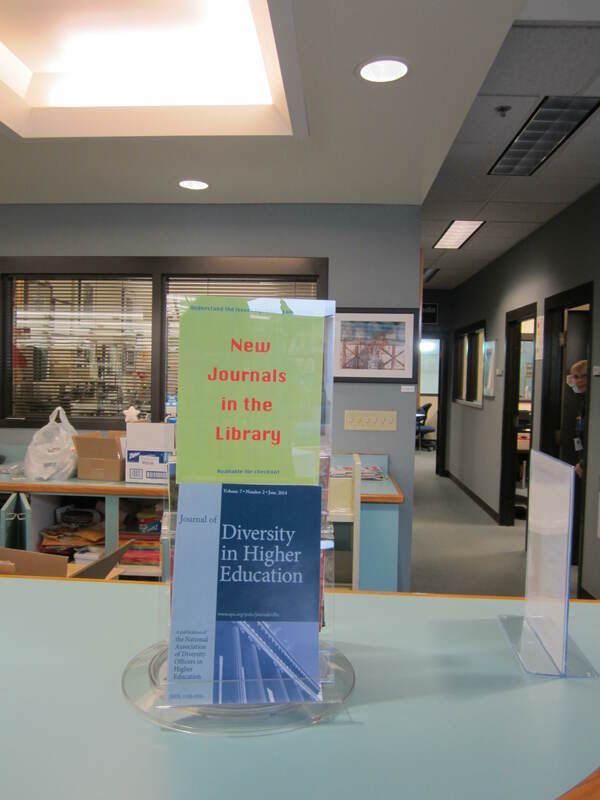 This entry was posted in Displays on November 12, 2014 by nluebke. 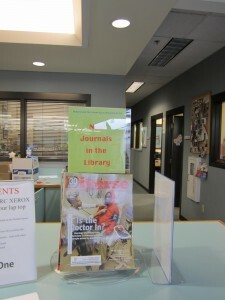 Stop by today and read an issue in the comfort of the library or check out an issue and peruse it at your leisure. This entry was posted in Announcements, Displays on November 10, 2014 by nluebke.